Uberski offers tailor-made luxury ski holidays to the largest ski area in the world. Because the company is based locally, their unrivalled knowledge of the Three Valleys ski area means they can put together a holiday that’s truly bespoke and memorable for any client. Catering for individuals, couples, families and groups, Uberski offers everything from a luxury ski holiday in exclusive accommodation with the services of a personal chef, to a budget-friendly break in the best 3* hotels the area has to offer. 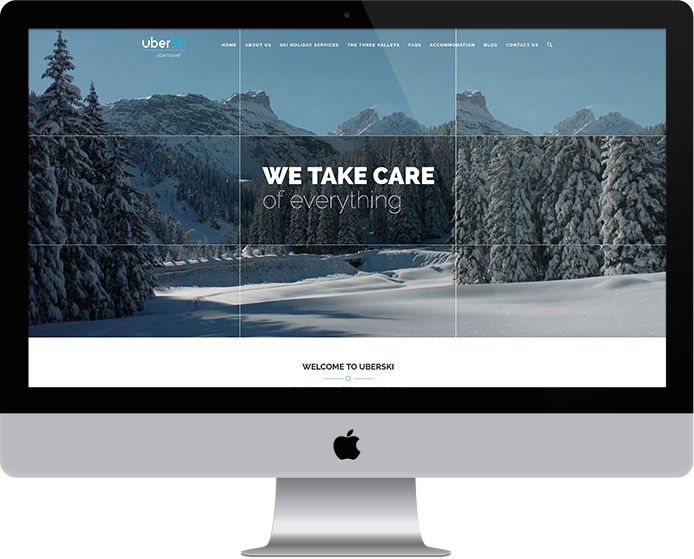 Our brief was to create a brand new web presence for Uberski, with a ‘holiday feel’ that would allow users to get a feel for the fun and exhilaration of a skiing holiday in the Three Valleys area. This was a project where the look and feel of the website was extremely important. We used large, dynamic images to convey the ski holiday feel and give a flavour of the dramatic landscape of the area. This entices the user to want to visit the ski resort and to contact Uberski to plan and organise their holiday for them. While the visual elements of the website were important to get right, we also worked hard to write the content to provide the right balance of friendliness and informality with professionalism, to convey the sense that an Uberski holiday will be both fun and brilliantly organised. The result was a website that combines arresting imagery with clearly accessible information, giving clients the reassurance that Uberski will deliver the highest quality ski holiday. To reinforce the local expertise of the Uberski team, the website also has a French domain name.